Archery : Hawkesbury Toolworx - Tools, Farrier Supplies & Outdoors - Specials- For an extensive range of tools for all types of tradesmen and all your farrier, hunting and ammunition or outdoor supplies. Here at Hawkesbury Toolworx and Camping we cater for all your archery needs, whether it be a complete bow package or the smallest items such as release aids and string wax. 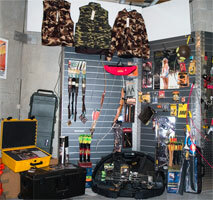 Our major brands include: Martin, Hoyt, Bear, Cartel, Scott, Plano and Easton Arrows, just to name a few. Please feel free to contact Dean or Rob at Hawkesbury Toolworx and Camping for any enquiry regarding your archery needs. Call today on 4571 3890.